1. Explain how each of the following developments would affect the supply of money, the demand for money, and the interest rate. Illustrate your answers with a diagram. d. The Federal Reserve sells bonds in open market operations. 2. The Federal Reserve expands the money supply by 5 percent. a. Use the theory of liquidity preference to illustrate the impact of this policy on the interest rate. b. Use the model of aggregate demand and aggregate supply to illustrate the impact of this change in the interest ‘rate on output and the price level in the short run. c. When the economy makes the transition from its short-run equilibrium to its long-run equilibrium, what will happen to the price level? d. How will this change in the price level affect the demand for money and the equilibrium interest rate? . 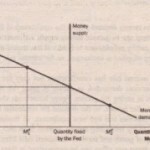 e. Is this analysis consistent with the proposition that money has real effects in the short run but is neutral in the long run? 3. Suppose banks install automatic teller machines on every block and, by making cash readily available, reduce the amount of money people want to hold. a. Assume the Fed does not change the money supply. According to the theory of liquidity preference, what happens to the interest rate? What happens to aggregate demand. b. If the Fed wants to stabilize aggregate demand, how should it respond? 5. The economy is in a recession with high unemployment and low output. a. Draw a graph of aggregate demand and aggregate supply to illustrate the current situation. Be sure to include the aggregate-demand curve, the short-run aggregate-supply curve, and the long-run aggregate-supply curve. b. Identify an open-market operation that would restore the economy to Its natural rate. c. Draw a graph of the money market to illustrate the effect of this open-market operation. Show the resulting change in the interest rate. d. Draw a graph similar to the one in part (a) to show the effect of the open-market operation on output and the price level. Explain in words why the policy has the effect that you have shown in the graph. a. if we define money to include checking deposits, what effect did this legislation nave on money demand? Explain. b. If the Federal Reserve had marinated a constant money supply in the face of this change, what would have happened to the interest rate? What would have happened to aggregate demand and aggregate output? c. if the Federal Reserve had maintained a constant market interest rate (the interest rate on monetary assets) in the face of this change, what change in the money supply would have been necessary? What would have happened to aggregate demand and aggregate output? 2 Suppose economists observe that an increase in government spending of $10 billion raises the total demand for goods and services by $30 billion. a If these economists ignore the possibility of crowding out, what would they estimate the marginal propensity to. consume (MPC) to be? b. Now suppose the economists allow for crowding out. Would their new estimate of the MPC be larger or smaller than their initial one? 3.Suppose the government reduces taxes by $20 billion, that there IS no crowding out, and that the marginal propensity to consume IS 3/4. 4. Some members of Congress have proposed a law that would make price stability the sole goal of monetary policy. Suppose such a law were passed. a. How would the Fed respond to an event that contracted aggregate demand? b. How would the Fed respond to an event that caused an adverse shift in short-run aggregate supply’> In each case, is there another monetary policy that would lead to greater stability in output? 5. Go to the website of the Federal Reserve, http;/www.federalreserve.gov, to learn more about monetary policy. Find a recent report, speech, or testimony by the Fed chairman or another Fed governor. What does it say about the state of the economy and recent decisions about monetary policy?